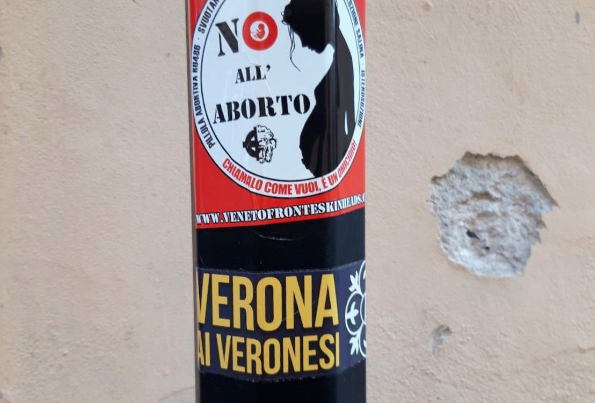 Anti-abortion and far-right stickers in Verona. The Italian neo-fascist party Forza Nuova is among the groups that have come out in support of the World Congress of Families (WCF) – the premier international gathering of anti-abortion, anti-feminist and anti-LGBTIQ movements which is meeting in Verona at the end of this week (29-31 March). The event will be attended by three ministers from the far-right Lega party: Matteo Salvini, the current government’s Interior Minister and Deputy Prime Minister; the Minister for Family and Disability Lorenzo Fontana (previously the deputy mayor of Verona) and the Minister of Education Marco Bussetti. Meanwhile, Forza Nuova has announced a series of parallel events in the Veneto region, which it has called “Italy’s spiritual reserve”, while Verona is their "Vendée of Europe" – referring to the French region that in 1793 saw a conservative uprising against the Jacobin revolutionary government. The neo-fascist party which has deep ties to anti-abortion movements in the country, including the ProVita organisation co-convening the WCF, opened a new office in Verona a few months ago and is increasingly visible in the city. The events it’s organising this week include a march in the city of Padua, the opening of another new office in Treviso, and a press conference in Verona on Saturday, 30 March – at the same time as street protests planned by the local chapter of the Italian feminist movement Non Una di Meno (NUDM). The group appears to be seizing the opportunity of the WCF to further raise its profile in Verona, a city seen as welcoming to even the most extreme right-wing organisations, where fundamentalist Catholics have powerful institutional allies including the current mayor, Federico Sboarina. 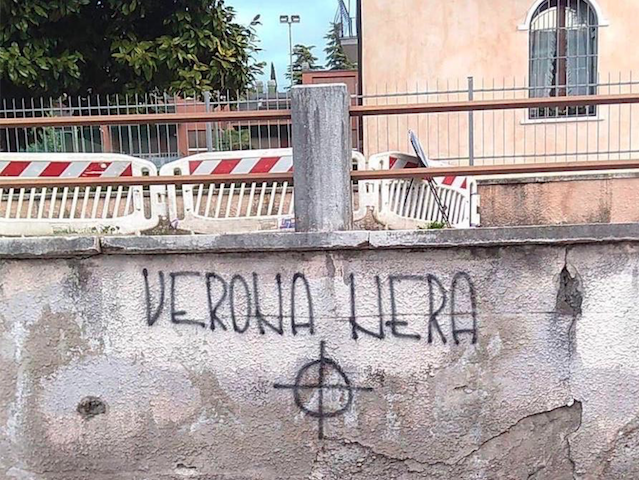 Far-right graffiti in Verona. | Giulia Siviero. On the night of his election, in 2017, Sboarina celebrated his victory wearing a t-shirt with the logo of a local company owned by known far-right militants. Previously, he led Verona’s sports department and is known to watch the Hellas Verona football team each Sunday along with other far-right fans. Since taking office, he cancelled a local "Living Library" project which shared stories of exclusion and discrimination. In February 2018 he welcomed the WCF partner CitizenGo into the city; they drove through it with a bus emblazoned with the slogan: "Don’t confuse the sexual identity of children". In October, Sboarina declared Verona the first “pro-life city” in Italy after the local council approved a motion allowing the public financing of associations linked to the anti-abortion movement. The day before this motion passed, Brian Brown, the current president of the WCF, was in town. Also last year, Sboarina promoted the first "Festival for Life" in the city, organised by the ProVita group whose spokesperson, Alessandro Fiore, is the son of Forza Nuova’s leader, Roberto Fiore. Both are expected at the WCF. Across Italy, Forza Nuova is joining demonstrations organised by a small group called ComitatoNO194 which is campaigning for a referendum to abolish the current law on abortion – passed more than 40 years ago. Fontana, the family minister, is also a registered member of this group. “The patriotic and revolutionary Christian wind has definitively entered Italy and Forza Nuova strongly pushes for legislative changes to eliminate abortion and initiate a great demographic growth in Italy”, said Forza Nuova’s Pietro Amedeo, at a ComitatoNO194 demonstration in Verona in November. Ahead of this week’s WCF, Amedeo also accused Verona’s Bishop Giuseppe Zenti of being "hostage to the homosexual lobby". After the Vatican’s Secretary of State, Pietro Parolin said “we agree on the substance… [but] there are some differences on the modalities”, Zenti suggested he’d rather not participate in “the political conflict on a theme that does not deserve the violent and ideological language of these days”. Though the bishop’s hesitation was short-lived: he confirmed his participation in the WCF saying “whoever sees a significant event in it, will join it”. Another active far-right movement in Verona is called Fortress Europe – a reference to Nazi propaganda during the Second World War. Despite being an offshoot of Forza Nuova, which also campaigns on similar themes to the WCF, it has not officially announced its participation in the event. On International Women’s Day, 8 March – while feminist activists took to the streets across Italy – Fortress Europe promoted the fascist slogan “Dio, Patria e Famiglia” (“God, Fatherland and Family”) as “the fundamental values on which every human society has always been based”. Meanwhile, after more than 500 University of Verona academics denounced the WCF as anti-scientific, a rainbow banner outside the school was damaged. It had displayed part of the university’s statute, saying that it “promotes pluralism of ideas and rejects violence, discrimination and intolerance”. A syllable was strategically cut out of the banner, transforming the word “reject” into “push” and distorting the meaning of the entire phrase. No group has claimed responsibility for this act, which reflects the level of tension in the city that extends from the very top of the administration to the streets.